On Friday I went to the New Lyrical Ballads event in Bristol, part of Bristol Festival of Ideas, and listened to 23 poets read their specially commissioned poems for a new version of Wordsworth’s and Coleridge’s 1798 collection. New Lyrical Ballads will be published this Spring and two Radio 4 programmes are also imminent. There were 21 poets on stage, compèred with humour and panache by Ian McMillan, who was among those who contributed a poem, and two poets (Jen Hadfield and Kathleen Jamie) read their poems via a recorded film. Being in the same room as such a large number of well-known poets, and hearing them read, felt like a big event. It was a big event! As Ian McMillan said, “In years to come, everyone will say they were here tonight.” Here are some photos from the Festival’s Flickr stream to give you a flavour of the atmosphere. Wordsworth and Coleridge set out to overturn what they considered the priggish, learned and highly sculpted forms of 18th century English poetry and bring poetry within the reach of the average person by writing the verses using normal, everyday language. The modern poets each wrote a poem in response to a poem by Wordsworth or Coleridge, or wrote a poem “in the spirit of Romanticism.” Coleridge seemed to be the favourite and four poets, I think, chose Coleridge’s ‘The Rime of the Ancient Mariner’. I liked it best when poets seemed to be writing about their own lives, rather than writing in the voice of someone they imagine to be ‘ordinary’. I wasn’t taking notes and can’t quote from any of the poems but my companion for the evening, Tania Hershman, was live tweeting so dip into her Twitter feed for a flavour of some of the poems. Here’s Liz Lochhead reading from her funny ‘How To Be a Romantic Poet,’ which was the evening’s closing poem. Bristol was central to the birth of Romanticism. William Wordsworth and Samuel Taylor Coleridge stayed and worked in the city; the first edition of the Lyrical Ballads was published in Bristol; and Bristol at the time was a place for debate often led by Coleridge in a celebrated series of lectures in 1795 and the publication of his newspaper, The Watchman. It was a time of revolution, progress in medicine and science, youthful democratic politics and the wide debate of ideas. 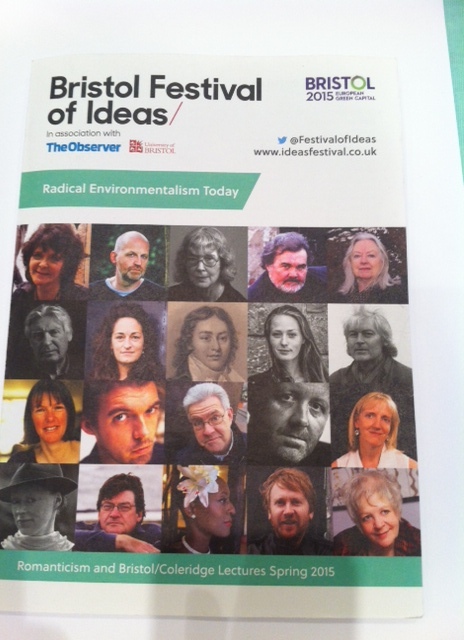 Visit the Festival of Ideas website for many more events. Enjoyed post and nice to find out Liz Lochhead one of the poets – I got turned on to poetry by a teacher who read us her poem ‘Inventory’. At the time I thought the line ‘and a you shaped depression on my pillow’ was one of the cleverest things I’d ever read! Thanks for a lovely comment, Col! So many teachers switch people on to poetry, they deserve to be more appreciated. I’ve just been thinking about Coleridge and Wordsworth and an glad I ran into your site with this info.